The European Commission (EC) told EDRi that it “will continue monitoring legislative developments at the national level” regarding the existence of data retention laws in EU Member States. 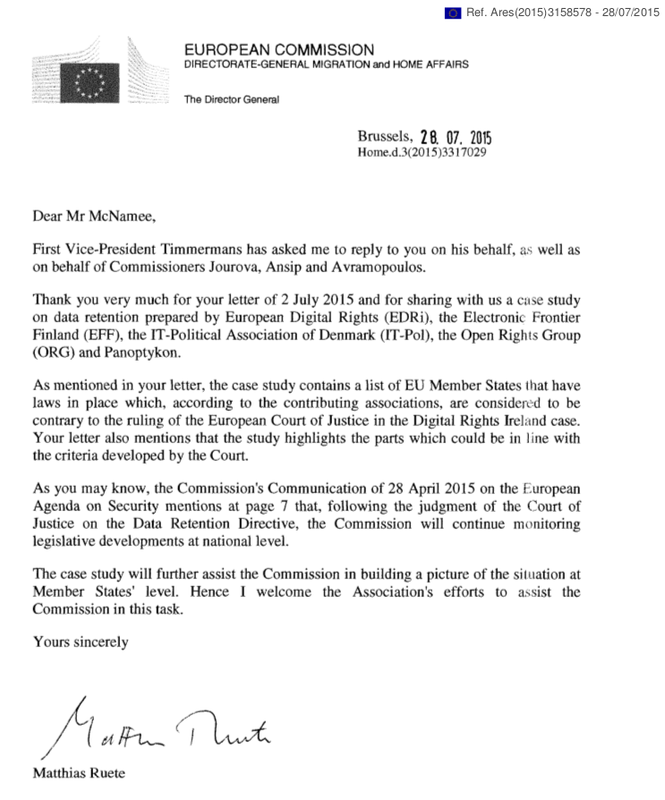 The EC provided this non-committal response to the letter we sent on 2 July 2015, asking the Commission to investigate illegal data retention laws in the European Union. EDRi, along with the Electronic Frontier Finland (EFF), the IT-Political Association of Denmark (IT-Ροl), the Open Rights Group (ORG), Panoptykon and other EDRi members, produced an analysis of a sample of existing national laws in EU Member States which requires the retention of their citizens’ personal data. Even though the Court of Justice of the European Union (CJEU) invalidated the Data Retention Directive in April 2014 in the Digital Rights Ireland Case v. Minister for Communications case (Joined Cases C-293/12 and C-594/12), there are still a number of existing and national laws in the EU which appear to be illegal in light of this ruling. EDRi’s analysis sent to the European Commission concluded that the existing laws in at least six countries appear to be in contravention to the Charter of Fundamental Rights. The Commission, as guardian of the treaties, is legally required to do the necessary further research and ensure that Member States bring their practices into line with EU law, making use of the infringement procedures if necessary. If the Commission continues only “monitoring”, with million of EU citizens being subject to illegal data retention laws one year after the CJEU ruling, this will not be enough. It is worth remembering that, before the Directive was struck down by the Court of Justice of the European Union, the European Commission used its powers aggressively to both threaten and apply every legal sanction available to force Member States to implement the legislation. The Commission furthermore refused a freedom of information request from Access Info Europe requesting access to relevant document from these cases.